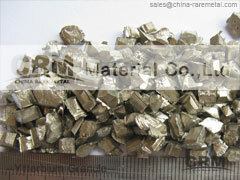 Ytterbium is a soft, malleable and rather ductile element that exhibits a bright silvery luster. A rare earth, the element is easily attacked and dissolved by mineral acids, slowly reacts with water, and oxidizes in air. The oxide forms a protective layer on the surface. Compounds of ytterbium are rare. Application --- in steel foundries industry for making FeSiMg alloy and it is used as an additive for hydrogen storage alloy. 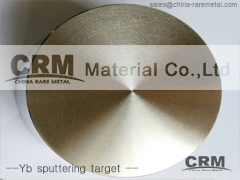 Applications --- Ytterbium Metal, is being applied in improving the grain refinement, strength, and other mechanical properties of stainless steel and alloys.Some ytterbium alloys have been used in dentistry. Like other rare-earth elements, it can be used to dope phosphors, or for ceramic capacitors and other electronic devices, and it can even act as an industrial catalyst.